Spend one week diving deep into asana practice, ayurvedic self care, and meditation at The Shala Bali, where jungle meets rice paddies and the open-air yoga shala ignites within you a new-found love for daily ritual. Our Level 2 option is for the yogi or yogini that has an established regular practice, has attended an Ashtanga Immersion or is familiar with the full primary series. This week will be an opportunity for you to go deeper into more advances asana, pranayama techniques and meditation. Perfect for the established practicioner wanting more. We'll practice the ashtanga vinyasa system in the mornings, paired with targeted strength and flexibility work to deepen your asana practice and understanding of progressions for your body. Afternoon sessions will be spent workshopping backbends and arm balances, and then relaxing with restorative yin and yoga tune-up practices, before discussing the energetics of our subtle body, yogic philosophy and how to enhance your modern yogic lifestyle. Enjoy delicious food on-site and have the freedom to explore glorious Ubud with all the shopping and organic delights just a short ride away. Journey Through the Chakras, Intensive Program Level 2: ashtanga, vinyasa, restorative practice, visualisation, ayurvedic cleansing practices, vibrational meditations, kirtan (chanting), pranayama, and journaling co-fasciliated by your leaders Monica and Emma. 6 hours of yoga everyday- Yes you will come back feeling amazing! *All prices below are per person and include brunch each day. All pricing is based on Twin-Share. Single room rates available on request. Email us at ritualyogaretreats@gmail.com for more information. Deluxe Luxury Villa : Experience the luxurious comfort of one of our 3 spacious Master Suits complete with living area, kitchen and bathtub, with Villa Rahasia Master Suite also boasting a private dipping pool. Thought and love were put into every detail of these chic Bali Villas. Why not spoil yourself ! 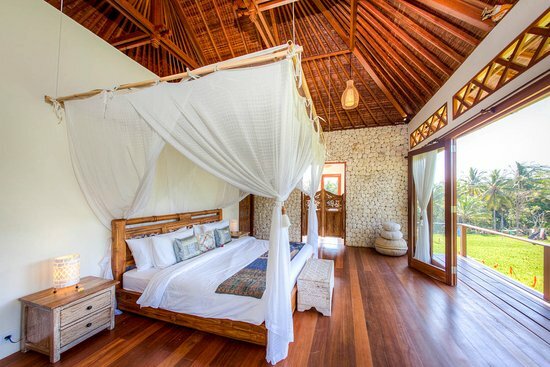 Standard Room : Modern Balinese inspired beauty at its best. 7 Villa Rooms each have their own unique colour, design and flair, while being equipped with the same essentials.